In this Blogger tutorial, we will look at how to make your blog look great on mobile devices by turning on mobile template for your blog in Blogger. Before introducing mobile templates feature in blogger, the blogs were not mobile-optimized version due to which some problems were faced by the blog owner to make their blog look great or mobile optimized version on mobile devices to attract their visitors.But that problem was rectified by blogger by introducing brand new feature called Mobile Templates or Mobile-Optimized Version for mobile Devices. Mobile Templates is a new feature added in blogger draft. By turning on mobile template for your blog in blogger makes it mobile optimized version. 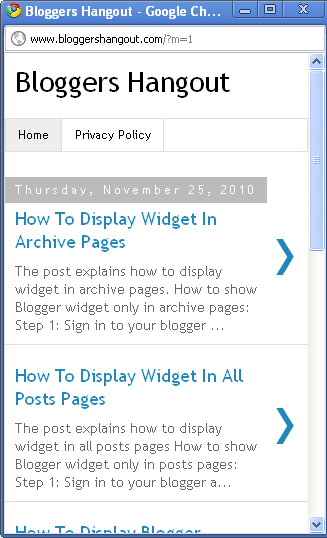 Open your blogger account in draft mode so that you can view new feature like shown in screenshot. It displays Email & Mobile tab by clicking turn on mobile templates button as shown in screenshot. Click mobile preview button and see the preview of your mobile-optimized version of your blog. and save settings under Email & Mobile tab.